Approximately 96% of our students tell us they would recommend our program to a colleague or friend. This incredible level of support comes from listening to our students and faculty, and making changes that will improve the overall learning experience, championing student successes and strengthening their connections among each other and the greater William & Mary alumni network. 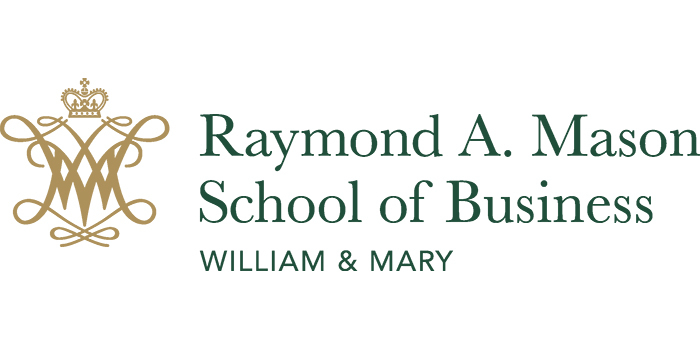 What is the latest news with William & Mary’s online MBA: any upcoming enhancements? The Mason School of Business recently received a $10 million private gift to support quality growth in our Online MBA and develop a portfolio of online programs. With this gift, we are creating a Center for Online Learning that will focus on strategic planning, and creating activities and programs that serve the needs of our Online MBA students. What type of student typically enrolls in William & Mary’s online MBA program? Our students are ambitious and are dedicated to investing in their personal and professional growth. They come from diverse professional backgrounds representing many industries, functions, and academic pursuits. Our faculty say they know our Online MBA students better than our residential students. They spend an enormous amount of time interacting with and getting to know each student. The connections happen everywhere, in the classroom, through email and Zoom, and in-person. Students can email or request a web conference session with our faculty, and we generally respond within 24 hours, although many of our faculty will respond sooner. Please describe to us your on-campus residency opportunity. Our on-campus experience is a signature component of the Online MBA program. Students come to campus for a weekend to fully immerse themselves in the William & Mary culture and community in addition to completing a one-credit class. It’s a busy weekend of networking activities and experiential coursework. We select different topics for each on-campus residency and frame the experience around a current business issue. Our most recent on-campus residency focused on Diversity & Inclusion and was led by our renowned Professor Inga Carboni. Do students work in a cohort or other structure? Can you share examples of teamwork and collaboration within the program? We start the program with a team assignment in our Renaissance Manager class which teaches students about different creative thinking methods to solve problems and uses design thinking as a framework. We then offer students the flexibility to progress through the program at their own pace versus requiring them to complete their coursework as a cohort. Our instructors range from full-time Mason School of Business faculty who publish cutting-edge research to seasoned professionals that have leadership experience in companies such as Uber, Oracle, and PwC. William & Mary emphasizes a Renaissance approach to solving the classic “Wicked problem”. How is this multi-disciplinary model applied in the education of MBA students? The “Wicked problem” is a way for students to customize the Online MBA. In their first course, Renaissance Manager, they work with the faculty to scope their Wicked problem. This can be a problem from their professional work or something of personal interest. When they reach the core Online MBA classes, they apply their studies to their Wicked Problem. In their final course, Revolutionary Leader, students synthesize what they’ve learned about their problem, recommended a solution, and create a virtual presentation as part of a capstone. All of our Online MBA students are working professionals with a minimum of two years of work experience. The Mason School of Business’s Graduate Career Management Center supports all of our online students in their career advancement. Top companies that recruit our MBA graduates are Deloitte, Booz Allen Hamilton, Capital One, IBM, Amazon, Oracle, Discover, CBRE, JP Morgan Chase, Verizon, FedEx, Cisco, NVR, Procter & Gamble and EY to name a few. First, decide how you are going to fit the time commitment into your life. Second, get your support structure in place. Your family, your work colleagues, your friends will support you during your Online MBA journey. Engage with them about it before you start the program. Third, plan how you will finance your degree. Check with your Manager or HR department about what support is available through your company, research scholarships you might be eligible for, and understand the payment plans and available Financial Aid options. Why should a prospective MBA candidate choose William & Mary? Our Online MBA students are truly exceptional and bring diverse professional experiences to our program. The MBA faculty at the Raymond A. Mason School of Business is consistently ranked at the top by the Princeton Review and we were recently ranked #1 for Learning by Bloomberg Businessweek. The program staff, faculty, and Graduate Career Management Center team are invested in our students both in the classroom and in industry. If you are ready for an exciting and rewarding challenge, we are ready to welcome you as part of our Tribe!